Address: Rua Gil Vicente C.C.Palmeiras 4º Piso, Guimarães (Región Norte), Portugal. Albergaria Palmeiras is located in the historic centre of Guimarães, a 4-minute walk from Guimarães Castle. It features a rooftop terrace with cushioned loungers and air-conditioned rooms with a balcony. 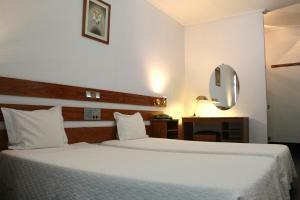 The rooms at Albergaria Palmeiras are decorated with warm colours and wooden furniture. All rooms have satellite TV and a private bathroom. Free Wi-Fi is available throughout Albergaria Palmeiras. The hotel also offers a 24-hour reception and room service. Every morning, a continental breakfast is served in the breakfast room. Guests can enjoy a refreshing drink at the bar, which also features karaoke equipment and a billiards table. Free private parking is provided on site, and Guimarães Shopping Centre is a 15 minutes’ walk away.